My entry to the 100% Pure New Zealand film competition is “Amazing Journey” The film shows how the first settlers on these magical islands, the indigenous Māori, had to battle the great Pacific Ocean as they came to New Zealand on a fleet of wakas (canoes). 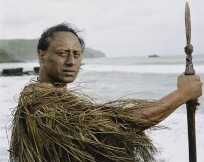 You will meet Kamaka, a Māori warrior and share his hopes and fears as he brings his whānau across the mighty Pacific Ocean to a new life in Aotearoa New Zealand. My one minute pitch for the film, submitted to the Your Big Break Competition.